Ensure your B is always safe and secure. Every new pack member—and especially rescues—pose flight risks. And Bs can be ingenious in executing escape attempts. (We have seen Bs escape full harnesses and martingale collars!) So as a general rule, exercise an abundance of caution in protecting your B from an escape. Your foster home should provide you with information about what to expect while your Basenji is traveling. He may act differently, though, with unfamiliar people. Some dogs need to stop shortly after starting–just a half hour–because vehicle vibration can stir the digestive system. It may help to take your Basenji on a brisk walk prior to getting in the car. He may not want to drink, but offer water anyway. You can also slip an ice cube or two into his crate. It will give him something to lick, a common nervous behavior. Know your route before starting. An unhappy Basenji is distracting even when contained, so minimize anything else that might require your attention, like finding your way. Do not allow your Basenji to ride free and unattended in the vehicle—havoc can result! Nor is it a good idea to have him ride in the back seat with strangers, particularly children. Even if there is a barrier to restrict him in the rear of the vehicle, under stress he could panic and bite those near him. An extra human! It is nice to watch your Basenji and leave the driving—and road worries—to your extra. 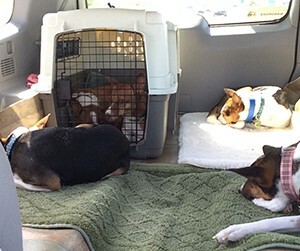 While many Basenjis travel well and settle down quickly, some pose challenges in a vehicle. We will let you know if we’ve had travel challenges with any of our dogs you may adopt. An extra collar – ideally one that buckles on in case your new Basenji is sensitive to movement of strangers around his head. See Collars, Leashes, Harnesses and Other Tools for details. A leash – one with a loop handle can allow the leash to be used as a slip leash. A chain leash may help prevent chewing, but do not use it as a slip leash! A secure crate – a plastic crate is most secure, but be vigilant to ensure that your Basenji has adequate airflow, particularly on sunny days in vehicles that lack rear ventilation. Bs will often be content in a crate that is a bit smaller than they would have at home. Do not force your Basenji into his crate by pushing him. If you are leaving the foster home, let the foster parent crate him. If you must crate a Basenji who is unfamiliar with you, try enticing him in by throwing a treat to the back of crate–natural treats like real chicken breast often work best. If necessary, weave an extra leash through a vent in the crate back, then use it to ‘lead’ the Basenji into the crate. If you cannot remove the leash, offer him something like a soft flexichew Nylabone to chew instead of the leash. See Containment for details on crates. Foam padding – blue, inexpensive camping mats provide grip, helping your Basenji feel more secure, while also being safe for him to chew or shred–there are no threads to swallow or tangle. This is one source–made in USA! http://www.walmart.com/ip/Stansport-Pack-Lite-Camping-Pad/9856753 Cut the mat to fit the bottom of the crate, making sure no straps , etc. end up in the crate. There is also a foam mat available in our local Walmarts–made in USA. While bathmats may be more comfortable, ingested threads are dangerous–a frustrated and confused Basenji might eat his mat to relieve tension. Water – it is best to fill a bottle with the water from your Basenji’s normal water source. Bottled water, even if better for him, may taste strange and discourage drinking. Paper towels and plastic bags – you never know when you will need to clean up… For good dog PR, please pick up your Basenji’s poop while traveling! An x-pen – while this is optional, pens are handy if it becomes necessary to transfer your new, and perhaps scared, Basenji between crates during travel. See Containment for details on x-pens. Emergency contact numbers – should you need unexpected assistance, have your contact plan ready.